signed and on verso titled, dated September 1960 and inscribed "Dr. E. Beaudry, De Sales, Chicoutimi"
In July and August of 1960, A.Y. Jackson was traveling through Ontario to Lake Superior and Georgian Bay, which he often visited, having relatives and friends there. Passing through the rural surrounds of Perth, he captured the soft, pastoral countryside just at the beginning of the turn to autumn. 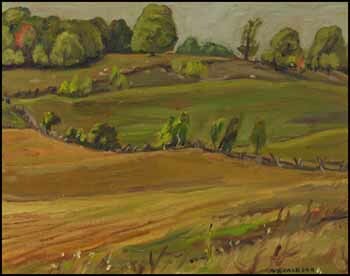 Typical of Jackson is his interest in the rhythm of the land, and in this work, he uses the fence lines to reinforce the gentle roll of the fields up to the top of the rise of land. In the golden fields and warm light, Jackson captures the nostalgic time of the end of summer.